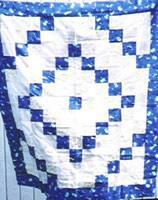 This fun quilt can easily be finished in a day. It is machine appliqu�d and machine quilted. 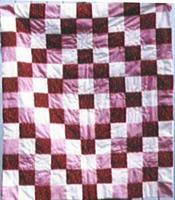 The pattern includes full-size appliqu� pattern, step-by-step instructions, and directions for two different quilts. Finished sizes are approximately 36 x 45 inches for the Quiltlet and 45 x 55 inches for the quilt. This is a perfect size for a baby or toddler quilt. Finished size measures approximately 55 x 55 inches. All template patterns and instructions are included. It is made in the traditional pieced patchwork fashion. Finished size approx. 63 x 63 inches square. This is a generous crib or toddler bed sized quilt. This quilt was designed by special request. It is made using three simple blocks. 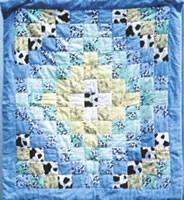 The duck square uses pieced templates with an appliqued eye. Full-size templates and step-by-step instructions are included. Suitable for all levels of experience. Finished size is approximately 44 x 60 inches. This popular pattern works up quickly in about 3 hours. The pattern includes step-by-step instructions and templates. Finished size is approximately 41 x 47 inches. This popular pattern works up quickly in about 3 hours. The pattern includes step-by-step instructions and templates. Finished size is approximately 39 x 44 inches.